Mighty Ra, bringer of sunshine. Have our hedonistic lifestyles angered the Mighty One? WASHINGTON, DC - Mighty Ra, the Sun God, commands the sun to rise for us each day, but a new report issued today suggests that the Federal Government's failure to pay Him due homage and respect may bring imminent disaster upon America and the world at large. The report, which was released by the Amon-Re Institute, a conservative think-tank, concludes that "America has turned its back on Ra, the Bringer of Sunshine. The harvest shall surely fail." The report outlines a number of ways in which the wrath of Almighty Ra could bring untold death and destruction upon the puny mortal inhabitants of this planet. "Many Americans take the bounty bestowed upon them by the Sun God for granted, with the hustle and bustle of everyday modern living," the report's author, High Priest Imhotep, told UnNews. "But the sun doesn't drag itself across the sky in a golden sun-boat each day. That is why the Federal Government should be leading the way in the worship of the Mighty One, lest the sun disappear forever from the sky, plunging the world into eternal darkness and despair." The report also claims that global warming and solar eclipses provide incontrovertible evidence that the Solar Deity is less than pleased with His human subjects. "It's clear that Ra is already very angry with humanity," Imhotep said, "Global warming is only the beginning of His vengeance. Our hubris has led us to believe that burning oil is the cause of global climate change, but we are wrong. This is a sign from mighty Ra that we have angered him." Is this monument to the Sun God enough to stave off His wrath? 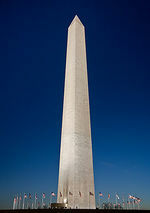 Several liberal commentators have dismissed the report, pointing to the giant 500-foot obelisk at the end of the National Mall in Washington built in honour of Ra and the huge parades held every November to give thanks to Him for continuing to bring life-giving sunlight to our world. However, Imhotep believes this is not enough saying: "We need to be building massive Sun Temples all over the country in His honour." The report criticizes wasteful spending by the Obama administration. In his economic stimulus plan, President Obama allocated just $2 billion to worshipping and paying homage to Ra, while a total of $4 billion was earmarked for the worship of lesser deities such as Osiris, Isis and Anubis. "This is pure pandering to special interests," said right-wing talk-show host Rush Limbaugh. "He should be putting the needs of ordinary Americans first by ensuring that Ra is appeased so that the sun will continue to rise." Some right-wing commentators, however, believe the report does not go far enough. "This whole thing started when they took ritualistic animal sacrifice out of public schools," former Republican Presidential candidate Mike Huckabee told UnNews. "We need to go back to the days when a goat would be killed and then burned in a daily offering to the Sun God in every American classroom. Only blood will quell the anger of the Mighty One." This page was last edited on 5 June 2012, at 08:18.